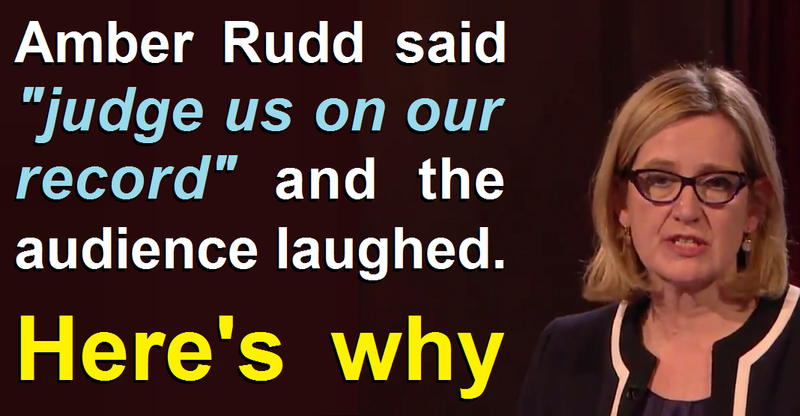 The indisputable highlight of the BBC Election debate that Theresa May chickened out of, was the moment when her human bullet shield Amber Rudd caused hilarity when she tried to defend the Tories' shambolic uncosted manifesto by saying "judge us by our record". It was a fantastic moment because it showed that the Tory reality-reversing propaganda is no longer washing with the British public. If you judge the Tories by their unspeakably dismal record in government then there's no justification for voting Tory at all (unless you're one of the super-rich elitists who have doubled your wealth thanks to the Tories rigging the economy in your favour). The only reason they say words like "judge us on our record" is that they're assuming that the British public are too intellectually lazy to actually judge their political record, and instead simply assume that the record must be good because they're boasting about it. Perhaps we're not quite as thick as the Tories assumed us to be? Theresa May's latest excuse for her cowardice is the worst yet! 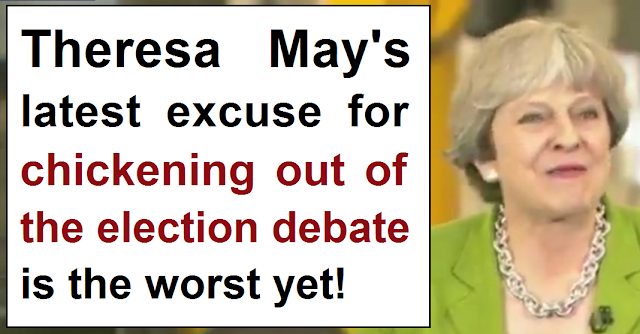 Theresa May's latest excuse for chickening out of the election debate is the most ridiculous yet. When confronted by journalists about why she was refusing to appear in the debates, she did a crackpot forced laugh, then tried to claim that Jeremy Corbyn is at fault for wanting to appear on the telly (as if putting yourself and your views before public scrutiny is some kind of abominable thing for a political leader to do), and that he should be paying more attention to "thinking about Brexit negotiations". There's so much wrong with this excuse it's absurd. Firstly, and most obviously, if Theresa May was so concerned about the importance of Brexit negotiations, then she would never have called this self-serving snap-election in the first place. How is it even possible for her to think the public are thick enough to buy her excuse that Brexit negotiations are suddenly so incredibly important to her, when she decided to put the negotiations on hold for two months to do this election when she thought she had an unassailable poll lead? How does setting the clock ticking on the most complex and risky set of negotiations and then calling a two month holiday in order to conduct a totally self-serving snap election demonstrate anything other than contempt for the seriousness of the situation we're facing? If the idea of appearing before the public is such a laughable concept, why on earth has Theresa May decided to send the Home Secretary Amber Rudd in her place? If the concept is contemptible, then just boycott it. If it's not such a waste of time appear yourself. This halfway solution is yet another demonstration of directionless leadership. She decided not to go, then instead of admit she was wrong and actually turn up, she's sending one of her underlings to act as her human bullet shield. She's too cowardly too appear herself because she knows she'd get eviscerated, but she's too directionless to stick by her decision so she's sending out Amber Rudd to take all the criticism on her behalf. Perhaps Theresa May's image consultants have told her to try to lighten up a bit because her snarky and brittle persona is putting people off? We all remember that bonkers shoulders-back fake laugh she did at Prime Ministers' Questions. She looks completely deranged when she puts on a laugh, so forced laughter hardly seems to be a sensible approach. What else can she do though. Staring furiously, angrily shaking her head when she's presented with facts she doesn't like, and launching into furious rants when things aren't going her way are hardly mannerisms that are going to win people over. The transparency of her false laugh is perhaps the strongest indication of why she won't appear in the live debates. She doesn't want people to see how her scripted persona is completely fake as she descends into either crackpot displays of faux hilarity, or furious snarky jabbering. Why should Corbyn be preparing Brexit negotiations? The idea that Jeremy Corbyn is wasting his time subjecting himself to public scrutiny because he should be preparing for the Brexit negotiations is an extremely odd argument for Theresa May to make. The only way to interpret May's words is that she thinks Corbyn is actually going to win the election, otherwise why on earth would he need to concentrate on his Brexit negotiating stance, instead of reaching out to members of the public? Just look at the state of it. This cowardly and directionless woman isn't fit to run a bath, let alone a country. Theresa May is a directionless coward who will say literally anything to excuse her yellow-bellied behaviour, no matter how nonsensical. She thinks she can get away with it because she believes the UK public to be a gullible bunch of halfwits who will believe any old word salad, as long as it's presented in a posh accent. 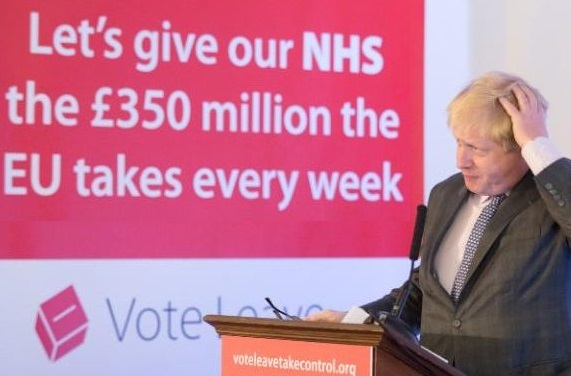 It's up to us, the British public, to prove her wrong. The results of the latest ICM poll paint an extraordinary picture of a shocking inter-generational divide. Just look at the graph in the header image and consider the fact that Labour are outperforming the Tories by almost 5:1 amongst the younger generation, who see Jeremy Corbyn's transformational investment based manifesto as a beacon of hope for a future with decent opportunities after seven bleak and ruinous years of Tory asset stripping. Unbelievably, despite the Tories' despicable Dementia Tax policy of imposing a huge stealth inheritance tax on anyone who hasn't hidden their assets in shady offshore shell companies, the over-65s are going to come out in force for the party that plans to strip them of their winter fuel allowance, scrap the triple lock on their pensions, and asset strip them if they end up suffering from age-related degenerative diseases. 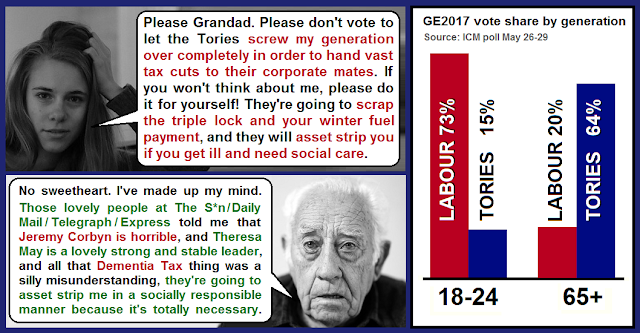 It's alarming that so many millions of pensioners are not only intent on voting to allow the Tories to trash the aspirations of their grandchildren by gutting education funding, keeping exploitative zero hours contracts, enforcing the highest fees at public universities anywhere in the world, chronically under-investing in infrastructure and innovation, and gutting public services in order to fund their tax cuts for corporations and the super rich, they're also intent on voting against their own interests too. Obviously not all pensioners are intent on voting for a dystopian future where the aspirations of the young are crushed and the assets of the old are asset stripped in order to fund tax cuts for very wealthiest in society, but a huge majority are. The reasons why are not clear cut and identical for all elderly Tory voters, but here are two of the big ones. The first big reason is that the older generations are very much more likely to be stuck in a mainstream media echo chamber, where their only sources of political news are the television, a single (incredibly biased) newspaper or their favourite radio station. Independent media simply has no way to reach the large percentage of pensioners who don't even have access to the Internet, let alone social media networks like Twitter and Facebook. Mainstream journalists often talk derisively about social media echo chambers, and the problem of selection bias on social media is undoubtedly a real one ... but anyone who thinks that people who use social media platforms like Facebook and Twitter are suffering a worse echo chamber problem than those who only ever rely on mainstream media for their news has got the situation so ridiculously backwards it's beyond parody. 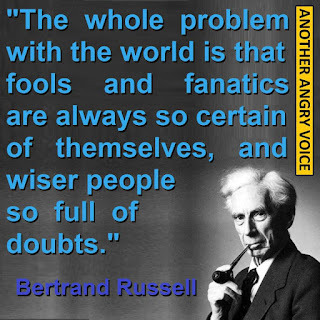 There's no polite or politically correct way to put this so I'm just going to come out and say it (with evidence to back it up of course): The older people get on average, the more gullible they are, the crapper their mathematical abilities, the more they're likely to over-estimate their own expertise, and the more attracted to right-wing authoritarian leaders they become. The Online Privacy Foundation carried out some very interesting analysis into the political psychology of the 2016 EU referendum vote. You can view the results here. Theresa May is undoubtedly the most right-wing authoritarian Prime Minister the UK has ever had. Yes Margaret Thatcher crushed whole communities in pursuit of her hard-right ideological agenda, but she never openly fantasised about trashing the European Convention on Human Rights and scrapping our human rights! 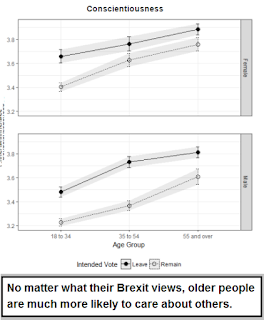 Another thing that the research revealed is that the older people get the worse their critical thinking skills and mathematical abilities become, meaning they're very much less able to see through shockingly misleading political propaganda, blatant smear jobs, misleading push polls and the like. People like to think it's the young who are gullible and naive, but the research shows that the wisdom of old age is a total myth. 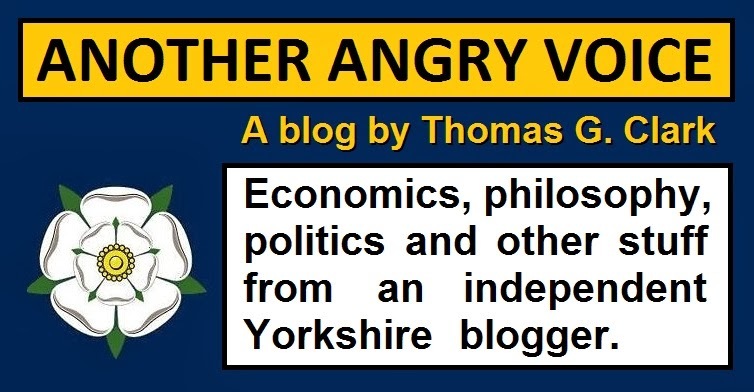 Once you start getting older, you start becoming ever more susceptible to believing in ridiculous economic fairy stories and mathematical jiggery-pokery. One other thing that the research shows is that older people are very much more likely to suffer from the Dunning-Kruger Effect. This is the problem that people with a very limited understanding of a subject are liable to significantly overestimate their level of expertise, while actual experts are liable to underestimate their level of expertise (the more you know, the more you realise you don't know too). The older people get, the more likely it is that they end up as a blowhard know-it-all on all subjects, even subjects they actually know next to nothing about. Obviously not all old people suffer this kind of mental decline (the best ways to avoid this kind of mental decline are mental and physical exercise, a good diet, and avoiding brain cell wrecking substances like alcohol as much as possible) but on average most people do end with declining cognitive abilities. 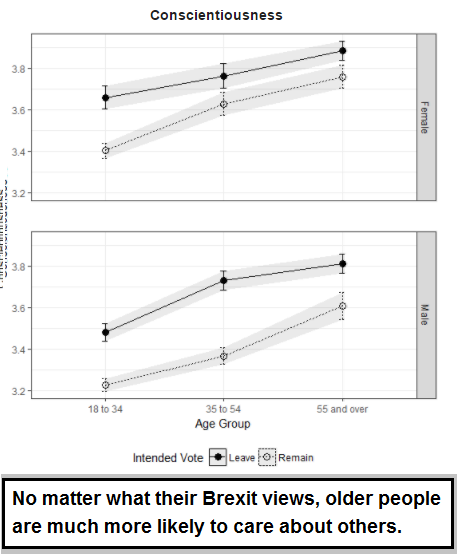 Most older people end up losing their ability to critique the things they're told, seriously over-estimating their own expertise, and craving harsh dictatorial right-wing governance. The only way we can try to stop the older generations from wrecking the aspirations of their children and grandchildren is to talk to them. We have to try to bridge the generational divide by getting them to rekindle the skeptical abilities they had in their youth. We have to try to make them understand that the majority of the mainstream media, and especially the right-wing dominated newspapers are trying to con them into voting for the Tories. Older people tend to suffer significant mental decline, but one hugely important thing that really stands in older people's favour is that they are very much more likely to be conscientious. They're far more likely to care about other people, behave selflessly, and put other people's needs above their own. Appealing to older people's-interest is a reasonable strategy. Telling them that the Tories are going to rip them off by scrapping their winter fuel payments, abandoning the triple lock, and asset stripping them if they get ill and need social care might work. However the cynical Tories know that they're more likely to be conscientious, so they've dressed these ideologically driven economic assaults against pensioners up as necessary sacrifices for the greater good. The Tories are so depraved that they know older people can be tricked into accepting massive personal impoverishment by telling them it's for the greater good, rather than a way of funding yet another round of lavish tax breaks for corporations and the super-rich (as it actually is). If you're going to try to appeal to an older person's self interest, it's absolutely vital that you make sure they understand that the Tories are lying through their teeth: That the cuts aren't for the greater good at all, but actually a way of funding even more giveaways for the millionaires and billionaires. Probably a much better way of appealing to older people is to talk about the significant differences the Labour manifesto makes for the younger generations, their own grandchildren. Talk about how the Tories are going to scrap free school meals and slash education funding so the kids of today have worse opportunities than previous generations of children. Talk about student debts. Explain that tuition fees in the UK are the highest in the whole world, and that nearly all the good jobs need a degree these days. Tell them that an incredible 70% of today's students will never be able to actually pay off their student debts despite paying a 9% tax for their entire working lives. Talk about exploitative zero hours contracts and how they represent a modern incarnation the unstable employment days of the 1930s where dockers and steelworkers waking up at the crack of dawn to queue at the gates in the desperate hope of being called to work, and having to go home with absolutely nothing if their name wasn't picked. Help them understand that the Tories aren't just taking wealth from the older generations, they're robbing wealth and opportunities from the younger generations too, just to stuff the already bulging the pockets of the super-rich elitists who totally bankroll the Tory party. 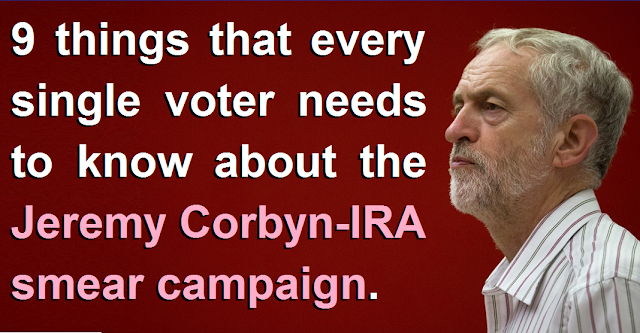 Give them a copy of the Labour Manifesto to read, and ask them to consider it for themselves. Tell them that you really like it, and that they should disregard what the Tories and the mainstream media say about it and judge it for themselves. The only way the Tories can be stopped from getting a whopping great majority, with which they can rob all generations in order to line the pockets of their super-rich mates, is if we all talk to our parents and grandparents and plead with them to disbelieve the Tory lies, think of themselves, and above all think of their grandchildren's futures.